Growing up in Southern California, we never got to do some of the things that I pictured other kids at Christmas time doing. Like playing in the snow, building a snowman, or coming in from the cold with rosy cheeks from caroling and then enjoying a yummy cup of cocoa. I can remember a few times when my mother pulled the Christmas ham out of the oven and had to wipe the sweat off her face because it was in the 80's outside and felt like a hundred degrees in the house. Maybe I saw too many Hollywood movies and all the impossible perfection they supplied my mind with, but I still feel like Christmas should somehow involve snow. But there is one thing that happened in my house when I was growing up, and that was Christmas cookies. My mother made dozens and dozens of them for us to eat and give to our teachers and friends. I can remember coming home from school and eating them with a glass of milk, and watching my mom roll dough into a ball and then rolling it around in a bowl of sugar to make Molasses Cookies. I think they were my favorite out of all the kinds she made. I've said many times that I wish I had some of her recipes, but I never asked her for any, and by the time I was interested she had already passed away. 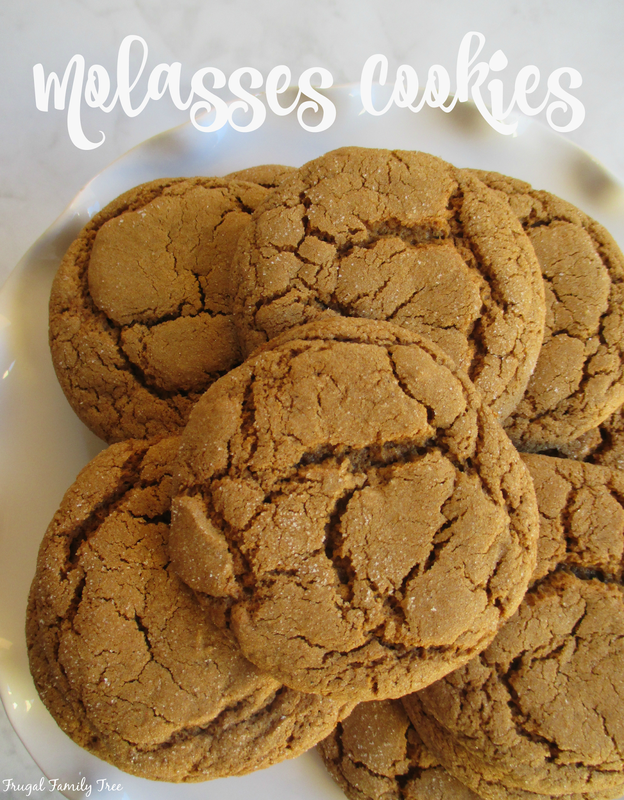 But I think she would have loved and approved of this wonderful recipe I found for Molasses Cookies in Taste of Home magazine. They are wonderful, and smell so good. These cookies are quite soft, and are quite large too. Shaping the dough into 2-inch balls is the perfect size, I think. And they keep well for a few days in a container with a tight fitting lid. I made a batch for my family and the grandkids loved them. We also gave some to friends who raved about them too. So they are going to be part of my cookie-making this year, and I'll be sharing them with friends and family. Preheat oven to 350 degrees. In a large bowl, cream butter and sugar until light and fluffy. Beat in eggs and molasses. Combine the flour, ginger, baking soda, cinnamon, cloves, and salt; gradually add to cream mixture and mix together well. Shape dough into 2-inch balls and roll in sugar until well coated. Place 2 1/2 inches apart on cookie sheets lined with parchment paper. Bake for 13 - 15 minutes, or until tops are cracked. Place on wire racks to cool.